Friday will officially be the last day of the Cedar Springs Police Department. To honor the years of service and dedication of the Cedar Springs Police Department to the City of Cedar Springs and its citizens, the public is invited to a “Change of Command Ceremony” on Friday, November 7, at 6 p.m., between the City of Cedar Springs Police Department and the Kent County Sheriff Department. The ceremony will be held in the Cedar Springs Public Schools Hilltop Administration building, 3rd floor boardroom. 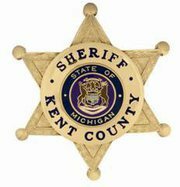 “The Kent County Sheriff Department recognizes the responsibility and trust the citizens and city officials of Cedar Springs have placed with the Kent County Sheriff Department. Sheriff Stelma and his staff look forward to bringing the Sheriff Department’s reputation for professionalism and top notch law enforcement resources to the citizens of Cedar Springs,” said Undersheriff Jon Hess. According to Sgt. Jason Kelley, with the Kent County Sheriff Department, The Cedar Springs officers will be “depinned” of their current badges, and repinned as deputies with the KCSD. They will also take their oaths of office there. Kelley said that Officer Mike Stahl, who patrols a night shift, would begin his shift right after the ceremony (about 7 p.m.) as a Kent County Sheriff Deputy. Sgt. Kelley said he began all the behind the scenes work to transition the department as soon as the City Council agreed to the contract October 9. “It’s been going well. We are on, or even ahead, of schedule,” he remarked. Sgt. Kelley will be at Cedar Springs City Hall police offices daily, Monday through Friday, once the transition takes place.